Thank You for Giving Your Baby the Healthiest Start to Life! Thank you so much for ordering the 14-Day Trial. Your Parcel will be posted out to you straight away. The reason Jane and I thought this was a good idea, is that we're convinced that as soon as You and Your Baby see and feel the difference with Beaming Baby Bio-Degradable Nappies, you'll realise these will make your baby Healthier and Happier, so you'll want to stay with us. 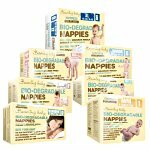 Please let us know how you and your baby are getting on with our Bio-Degradable Nappies, Organic Baby Wipes and Organic Bath Products. Remember, as a special Welcome, and Thank You for giving this a go, we'll be sending you 4 FREE Bonuses! FREE Bonus Number 4 Free 24 Hour Delivery, So you can IMMEDIATELY Give Your Baby The Healthiest Start to Life! That's a massive saving, just for you! And you won't pay anything for a full 14 days! After two weeks, provided you are totally happy with everything, you'll cover the Unbelievably Low Price. That's not all, you'll also benefit from our 365 Day, Total Happiness, Money Back Guarantee! So if you or your baby are not totally happy with anything from us, just call or email us and we'll arrange a Free Collection, and a full, instant refund or credit. You have Nothing to lose and Your Baby has Everything to Gain! I'm looking forward to hearing how you and your baby are enjoying Your New Life, with Beaming Baby!